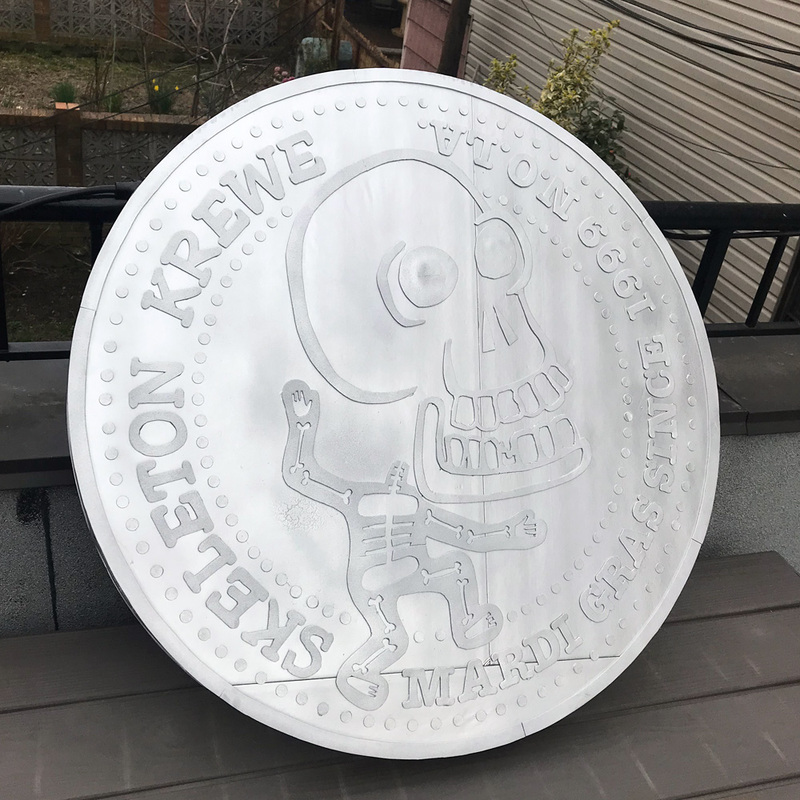 I started by printing out two versions of the doubloon, like last time: one normal version so I could tape it together and use it as a guide, and one version with all the pieces separated, so I could cut them out to make the individual 3d elements. 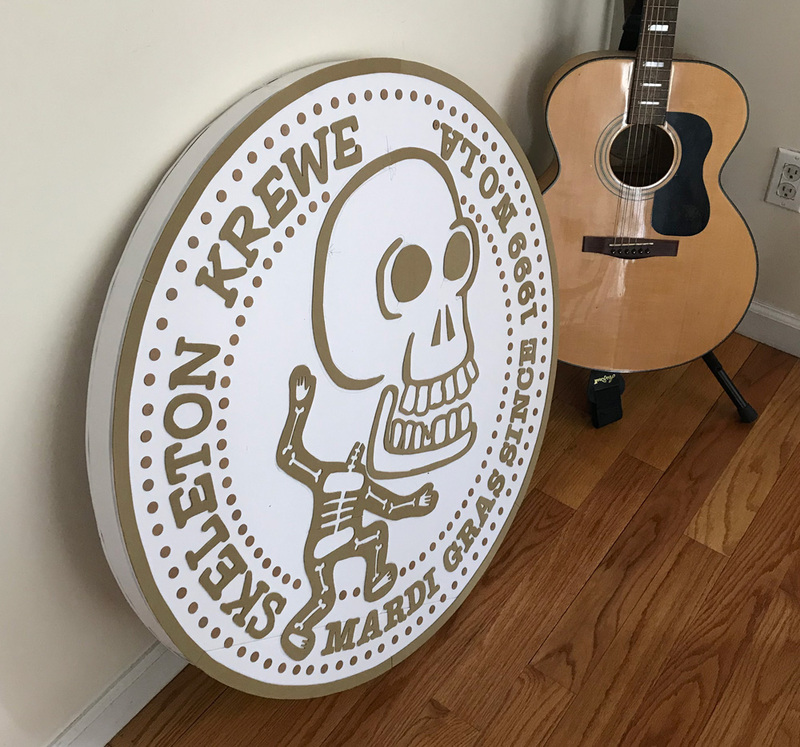 I taped a few pieces of 30″ x 20″ foam board together with shipping tape to make the sides of the doubloon. 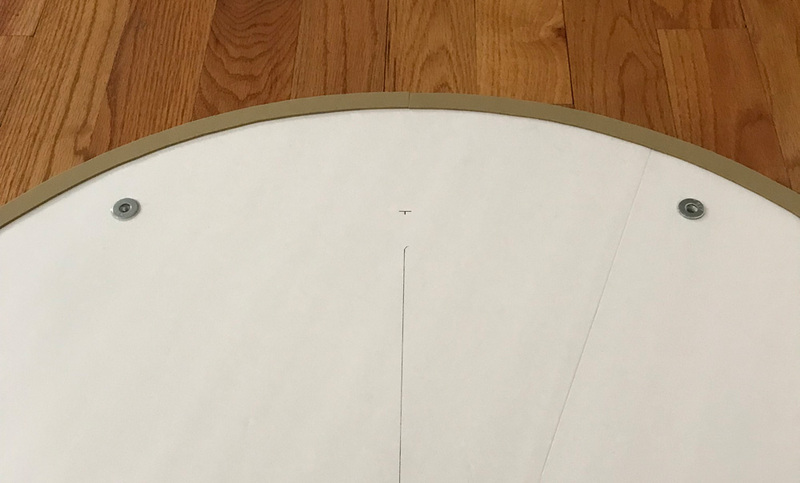 I measured and drew two circles at 33″ in diameter, and cut them out with an X-acto knife. 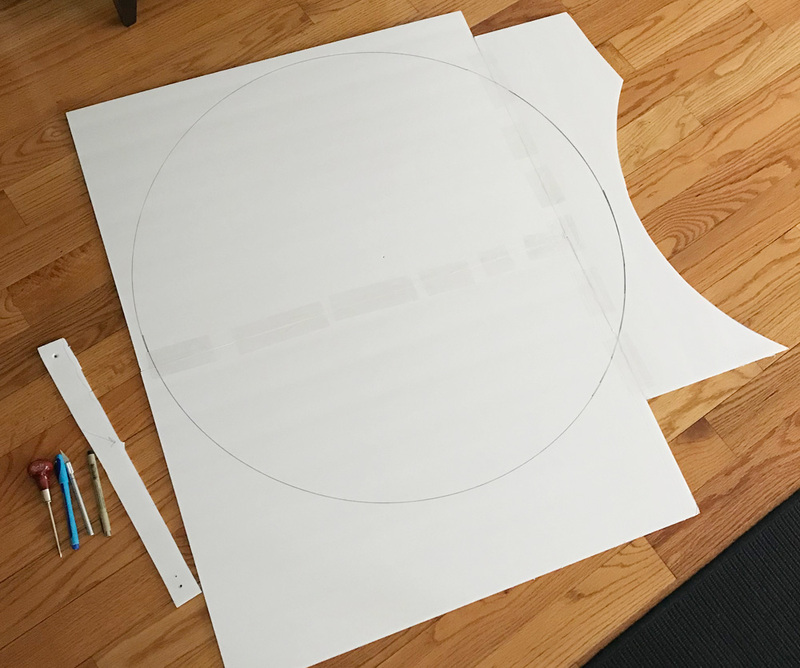 See my article about drawing precise circles here. I only put tape on one side of the foam; this would be the inner side. I didn’t want any tape on the outer surfaces because I was concerned it would be too visible once I painted the thing — the tape would be more visible than the exposed seam itself. Of course, the way to avoid having any visible seams at all would be to buy giant pieces of foam board, but they’re crazy expensive! The above grid is to make 8 rows of 3 strips each — each strip is 10″ long, divided into 3 segments of 3.5″, 3.5″, and 3″. Instead of using strips of poster board for the outer edge of the doubloon like last time, I used a few strips of foam board for this one. 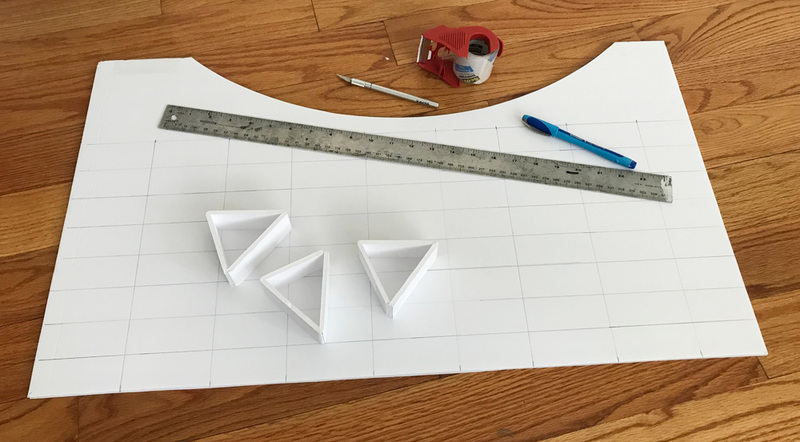 I curled up these foam board strips by wrapping them around a wine bottle, and then I worked them through my fingers, bending and crunching them all along their length to make them nice and curved. 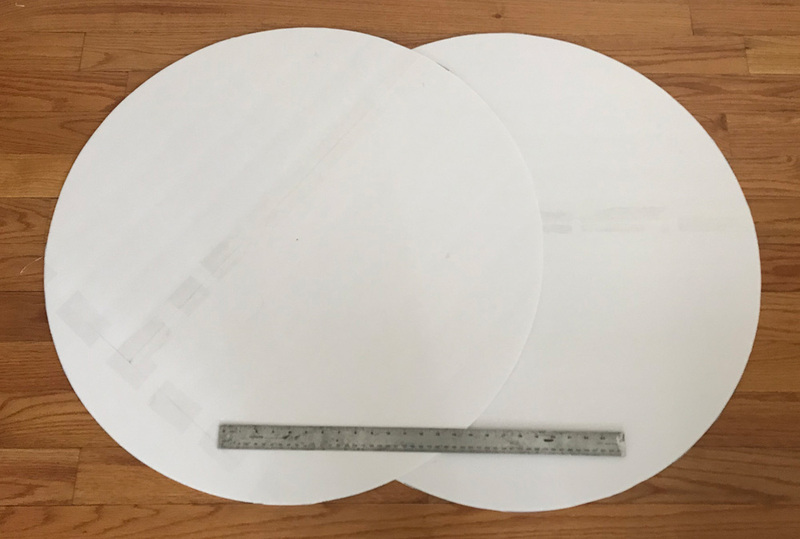 I taped these together at the ends with shipping tape and then hot-glued them in place around the edges of my doubloon shape. I decided to cut a hole in the bottom of the doubloon so it can be carried on a pole or broom handle. I cut a hole in the bottom edge of the doubloon and reinforced its edges with shipping tape. I built a narrow rectangular box shape out of foam board, reinforced all the “walls” of this shape with tape so they won’t tear, and hot glued the thing in place inside the doubloon. I put extra tape over the small top panel of this box shape (the far end in this pic, not visible), to prevent the pole from poking through — after all, the weight of the doubloon would all be pushing down on this one little spot. To place the front panel onto the rest of this stuff, I put dots of Tacky Glue all around the edge and also on all the triangular supports and the narrow rectangle in the middle, and then I carefully laid the panel in place. I weighed the whole thing down with a ton of books for a few hours, to make sure all the surfaces were really making contact. I made all the 3d letters and skeleton bits out of craft foam and wallpaper adhesive using the same exact method as for the 15″ version. They were so much easier to cut out than last time, since they were twice the size! Cutting out all those tiny shapes last time nearly killed me. Anyway, I then removed the paper guides on the foam bits by soaking them in water, like last time. 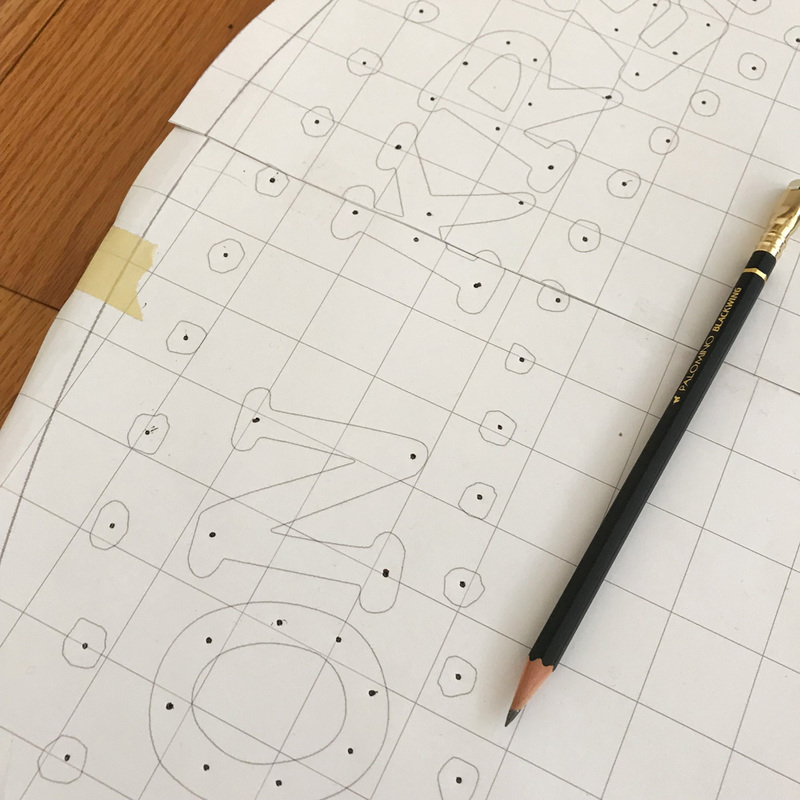 I bought a 1/2″ hole punch for the ~140 dots in the doubloon design. However, I found out my craft foam wouldn’t fit in the thing! The opening was way too narrow. So I ended up punching all the dots out of thin pasteboard; a LaCroix box and a Saltines box. Since these were so much thinner than the craft foam I was using for the letters and bones, I decided to double them up. I punched out 280 dots and then glued them together with Tacky Glue in stacks of two. It sounds like a lot of work but it went fast. 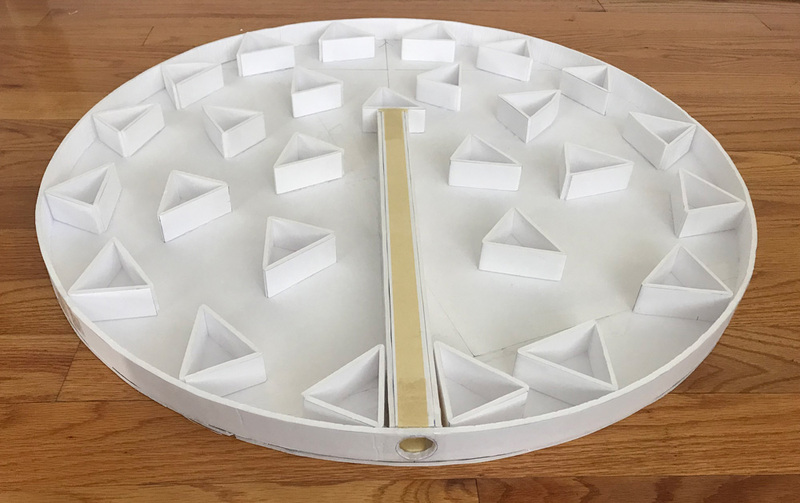 I made the outer ring of the doubloon design from craft foam using the same method I did for the 15″ version. I placed all the 3d elements onto my doubloon in a very different way from last time, using my printout as a guide. I taped the paper guide in place over my doubloon, and then I used a pencil to poke holes through the paper and mark dots on the foam surface of the doubloon. 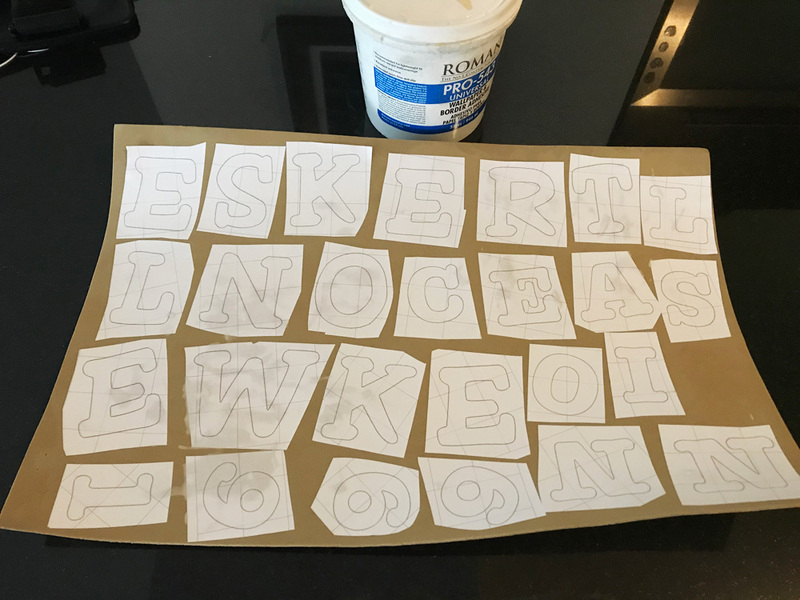 I marked dots in the rough shape of each letter so that I could later glue the foam letters in place and get them in exactly the right positions. For the skeleton bits, I poked a bunch of dots in groups and lines to show me exactly where to lay those pieces. And I poked dots for all ~140 of those little foam dots that needed to be placed as well. I removed the paper guide, and then I used Tacky Glue to glue all the 3d elements in place over all the little dots I marked. I gave the doubloon a good 24 hours to dry. Since the foam is non-porous it can take a long time for the glue to dry in between all those pieces. 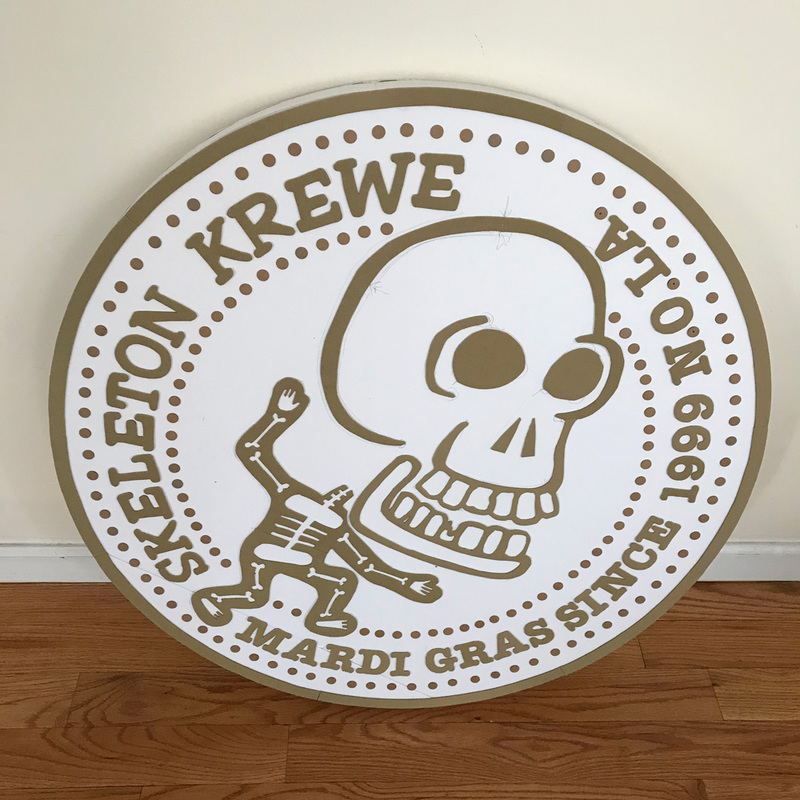 I poked two small holes in the back of the doubloon so it can be hung on a wall on two nails. I first poked the holes with an awl and then stretched them a bit with a paintbrush handle. 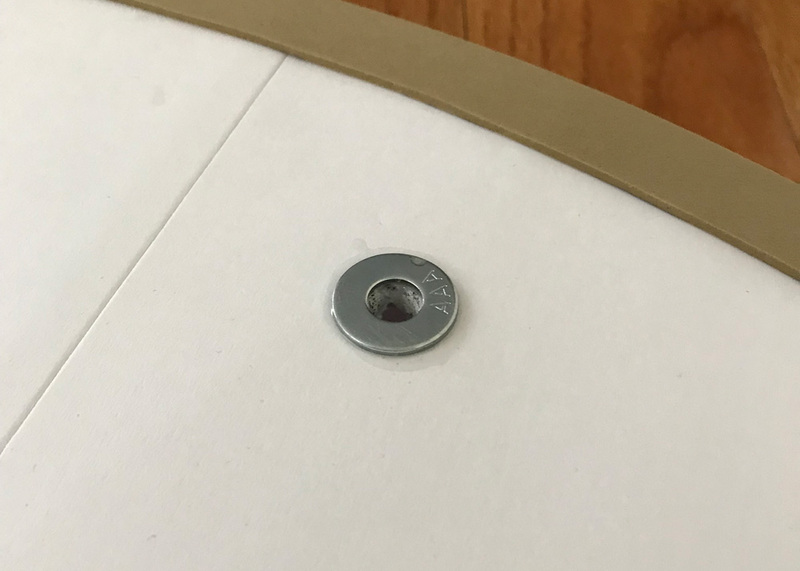 I reinforced the holes with metal washers; I scratched up the backs of the washers with a screwdriver and then glued them to the foam board with Gorilla Glue — the clear kind that doesn’t expand. Scratching up the surface of the metal helps the glue hold on a lot better. Using this relatively liquid-y glue meant I could put a few drops around the hole, then drop the washer in place, and the glue flowed out a bit so that it’s also holding onto the outer edges of the washer. 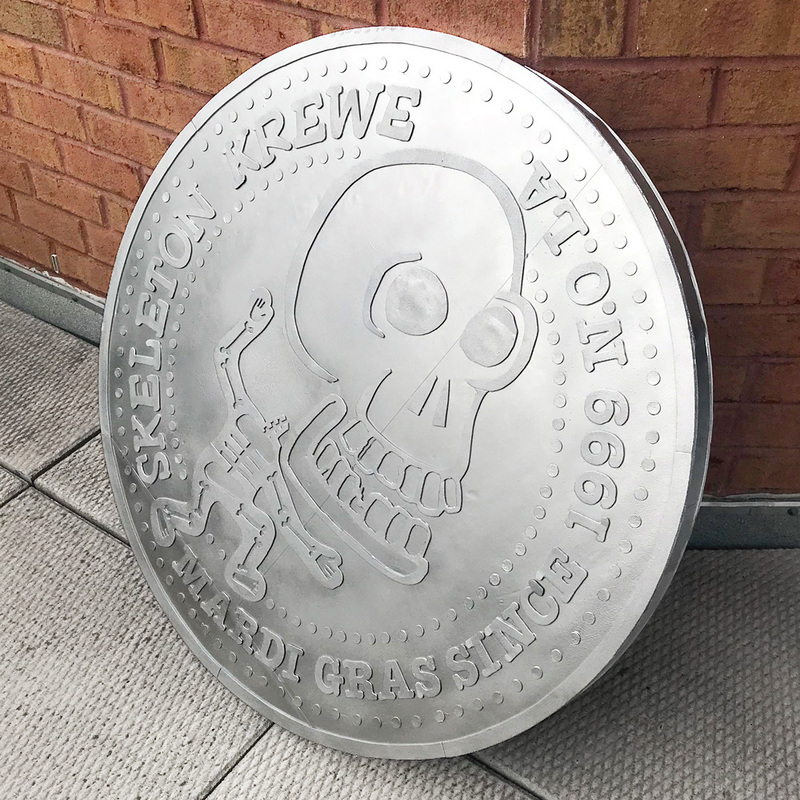 I applied two coats of gesso to front of the doubloon, and then a good solid coat of metallic silver spray paint all over, just like for the 15″ version. And this thing was done! Look how huge it is! Packing and shipping this monster was almost as work as making it — I’ll spare you a boring article about that, though!